Buying a beautiful ring for the woman in your life who is a bit quirky in nature can be hard. It’s unlikely that she’ll enjoy a traditional diamond ring for an engagement ring or holiday gift. (think Valentine’s or your anniversary) This woman rejects all things that are traditional and boring. She wants a funky ring that will really stand out among the simple solitaires and traditional white diamonds. For this woman, you’ll want to go with a stone like the pink tourmaline. Especially if her birthday is in October, which is the stone for the month. Pink tourmaline is a popular choice for this type of stone, but it also comes in a ton of other colors like purple, blue, red, green, and orange. When compared to a pink diamond, the pink tourmaline makes a great substitute, but it isn’t a cheap gemstone. For some of these stones, you can pay upwards of 200 per carat and beyond depending on the color. The price is also dependent on the setting, metal choice and other stones that accompany the tourmaline. This natural pink tourmaline has been heat treated to enhance its color. The stones measure 6 x 4 mm and 4 mm while the opals are 5 x 4 mm. Gemstones on this ring are 1.40 carats in total weight. The stones are set in solid 925 English sterling silver. The markings on the ring are the stamp of the London Assay Office, which includes the royal lion and the leopard’s head. The entire ring is made in London, which gives it an interesting history your non-traditional lady will appreciate. It comes with a lovely box so you can present the ring to her properly. The sizes of the ring range from 4 to 12 with quarter and half sizes available. It’ll truly fit every finger imaginable. Diamonds that are part of the Amazon Collection are trusted and confirmed to adhere to the Kimberly Process of extracting diamonds, which means they’ll be conflict free stones. The diamonds have a clarity between I1 and I2 and a minimum color of H-I for those who want to ensure quality diamonds. 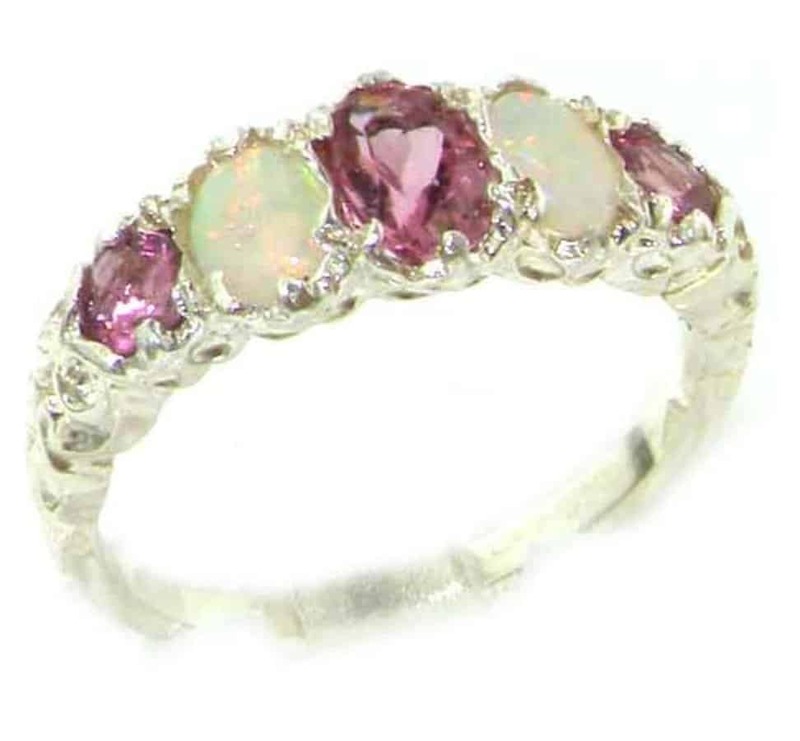 The pink tourmaline and opal are the star of this show, though. 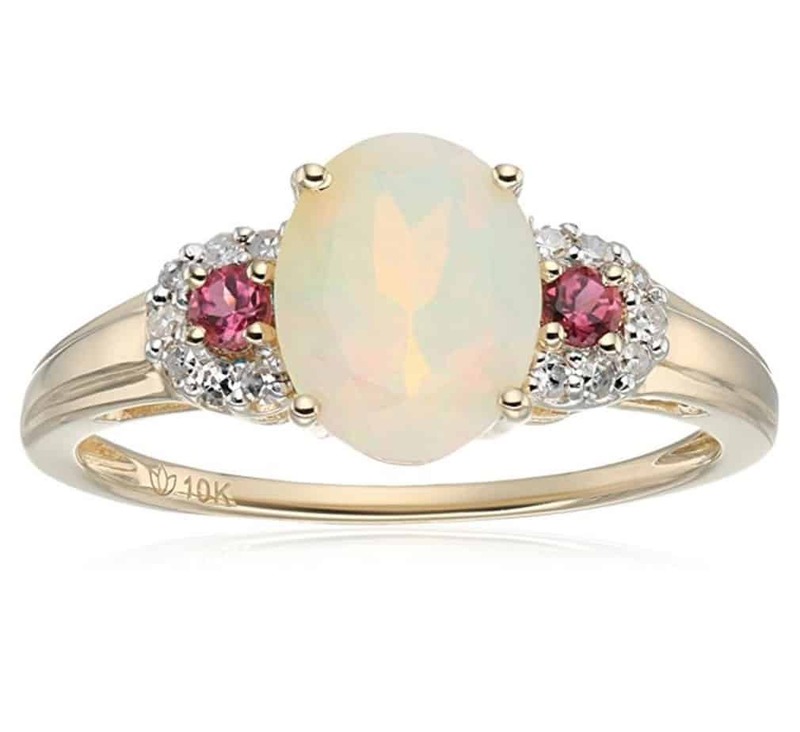 The total gem weight is 1.06 carats with the opal and tourmaline set with prongs in a 10k yellow gold setting. Sizes range from 6 to 8, but the ring is resizable. This is a beautiful, yet, unconventional engagement ring. It also comes with a presentation box. 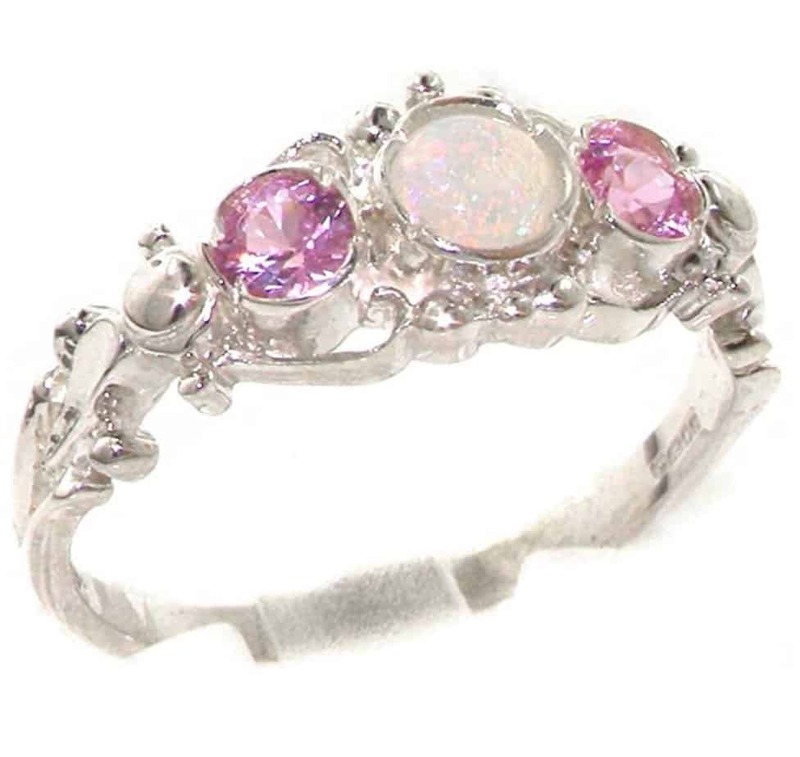 With the main opal and side stones of pink tourmaline, this ring is a stunner. The entire ring was made in England, and she’ll love that piece of history on the ring. It was inspired by the Georgian period in England, which will be another selling point for the ring. The solid English silver is stamped with the full British Hallmark. It’ll include 925, the royal lion and the leopard’s head. The opal measures 4.25 mm and the tourmalines are 3.5 mm. It comes in sizes 4 through 12 with half and quarter sizes for every finger. While it’s touted as an engagement ring, this can be given for other occasions like Valentine’s day, her birthday or your anniversary. 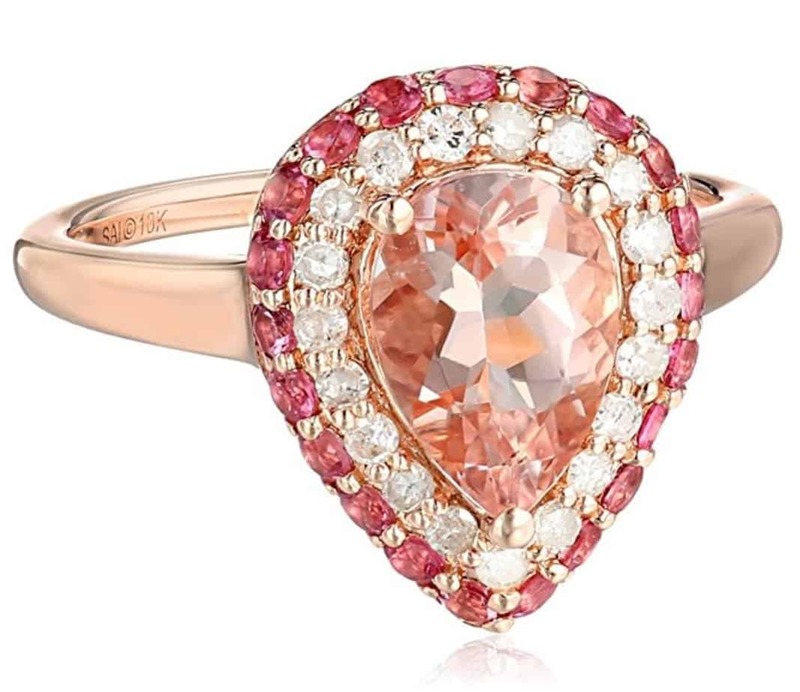 The rose gold is stunning against the 2.75 mm pink tourmaline and 0.72 cttw Morganite center gem. 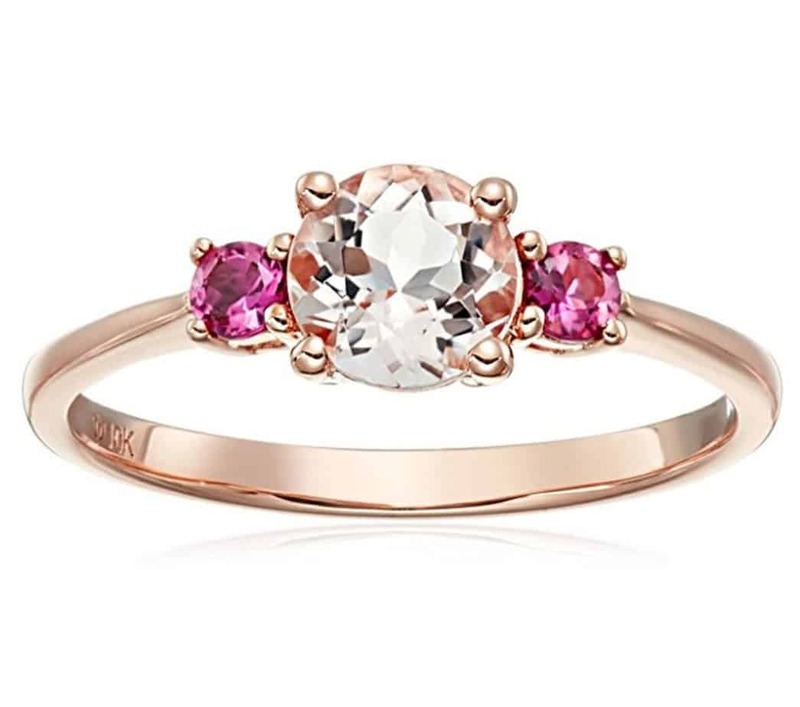 The pink tourmaline has been heat treated to really enhance the color of the gems, which isn’t a practice that reflects in the value of the stones like it would for a diamond. The ring is available from the manufacturer in sizes 6 through 8, but the ring is resizable for anyone who isn’t within this limited range. It comes with a beautiful presentation box, too. We saved our favorite for last. This is a pear-shaped beauty with a large morganite stone in the center surrounded by two rows of halo stones. The first surrounding row is white diamonds while the outside is pink tourmaline. We chose this funky ring for the list because if this isn’t unconventional and unique, we don’t know what is. The diamonds, morganite and tourmaline are natural with a minimum clarity of I2-I3 while the color is H-I. The total weight of the gems is 2.08 carats. The entire ring is 16 mm in length and 2 mm in height. These funky pink tourmaline rings are terrific for any gift-giving occasion, but we love them for unconventional engagement and wedding rings. They’re also perfect for anniversary rings to replace the current ring she might be wearing. When choosing one of the rings, make sure it’s a metal color that she’ll love. Many of the rings come in silver, gold or rose gold, and are not available in other metals.